The nun that appears in her habit, above, is Sr. Anna Nobili, from the Worker Sisters of the Holy House of Nazareth, a religious congregation based in Lombardia in north Italy. Anna Nobili was a stripper and belly-dancer in night clubs before she converted and entered the Worker Sisters. Instead of counseling Nobili to completely change her life, her superiors advised her to continue her dancing, but to eliminate its boldest steps. So she did. She founded a school of dance in the Diocese of Palestrina, suburbicarian of the Diocese of Rome, and named it Holy Dance. Since then she has been invited to perform on many different occasions for religious events. Scenes from two such performaces are pictured above. The group is sponsored by the Pastoral for Youth of the Palestrina Diocese. 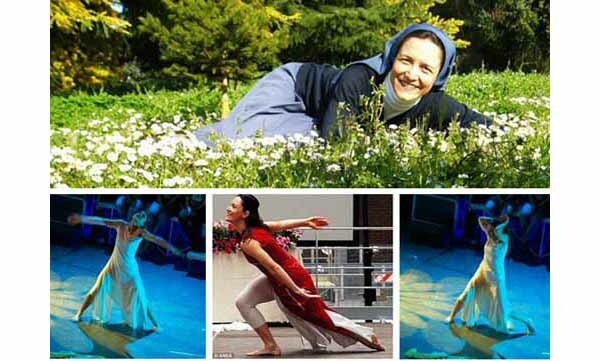 Below first row is a promotional photo collage from the Holy Dance website featuring some spectacular poses of Sr. Nobili. Second and third rows, Nobili and her team perform the piece "The seven doors of sin," where each sin is duly expressed in dance; pride (second row) and sensuality (third row) are the ones shown in these photos. Fourth row, her disciples in another sensual performance for youth. Fifth row, from the entrance page of the Worker Sisters website. 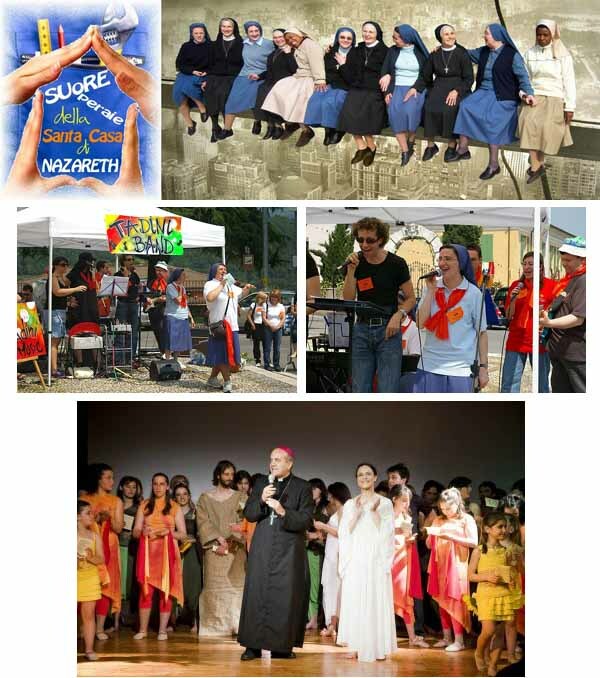 Sixth row, two shots of the rock show and dance the Sisters promoted in the city of Botticino Sera to commemorate the beatification of her founder. Seventh row, the Bishop of Palestrina, Domenico Sigalini, shows his support for Sr. Nobili and her team of dancers. The website of Holy Dance can be accessed here; the Worker Sisters' website here. Watch a video of a performance of Sr. Anna here.